Try to get a quote on Ti. I know it's a lot more, but as soon as I packed a SS stove out I knew I wanted Ti for backpacking. The design is bomber. I've asked about doing titanium in the quote requests. Just sent two more out. Haven't heard back from the one yesterday yet. I'll let you know once I get some details back. Thanks bro. I think there are several more looking for Ti. I appreciate your work. Thanks for sending the RFQ. The stainless will be less cost unless you have access to scrap Ti. We can get 16 stoves from a 24"x48" pc so it would be nice. Our price to cut each kit is 45 dollars plus material. At that .13" thickness. Our price to cut a kit from 16 gage or 06" thick is 22 dollars each plus material. The tab slots appear to be set at .045" thick. That thickness kit is at 20 dollars each. Also the stove base with all the holes can be made at less cost with a different design and not holes. It is lower cost to have less start points like at each hole and have fewer starts by the use of slots. We can start cutting 2-3 days after material arrives. He seems to have ignored my request for 19 or 20 ga. steel. I'll write him back and ask about it. Also, he mentioned lowering the price by skipping the holes in the bottom plate. I could drill them out myself on my own kit but I'd kind of rather not have to. 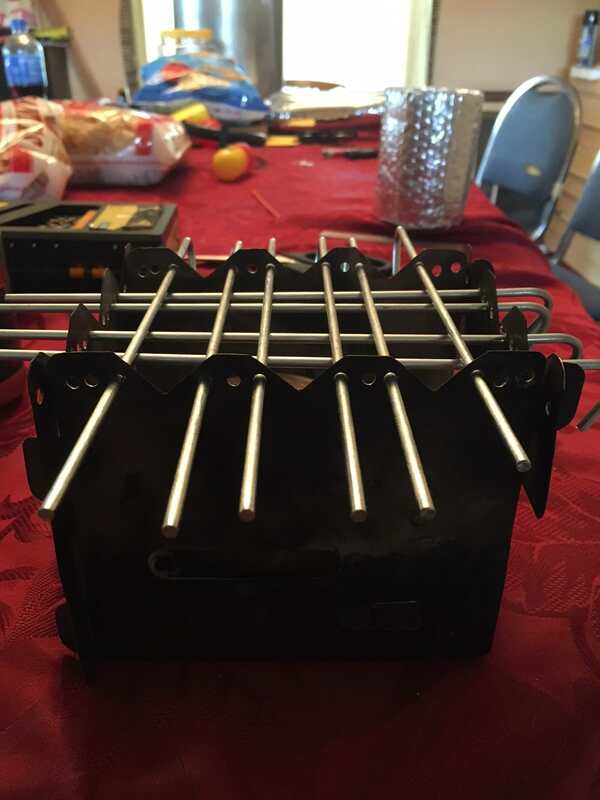 The whole point of this is getting a nice, manufactured stove so I like to keep the holes in the design. What do you guys think? Good work with everything diogenes! Thank you very much bud. I can drill holes.. Heck I can cut out, file, and grind the entire stove for cheap.. it would work, but be janky as all hell! Me personally I'd prefer to get it completely prefabbed, just to have a nice clean little setup.. $20-30 price range works for me, but over that might as well get a SS emberlite instead. Just my thinking of course. I've been accused of being boring.. I agree. I could do the entire thing myself, too, but I'd like to have a nice shop-made setup from go. I'll see what he'd charge for a thinner gauge or what it would cost if I procure the metal myself. I know places for that, too. Maybe I'll call them about a sheet of Ti. Still no word from the other places yet. I'll give 'em a call tomorrow and see if I can speed up the process. Just to let you guys know: I haven't forgotten about the stoves. I figured I'd get an email back after Christmas or at latest after New Years from the guy I've been talking to. Looks like he forgot about it though. Come Monday I'll shoot him a line and see what's up. It always seems to be easier than it turns out to be. Holidays throw a wrench into the mix. Put my name in the hat, for which ever, but Ti would be cool. Forgot to email the guy yesterday. Was too busy playing in my snow fort. I'll send one out now. So it appears we have 8 people so far? Is this Ti or SS. I'll pop for either to make it happen. But hope for Ti. I've found a place where I can get some titanium. No word on pricing, though. I'll update as I find more out. Have you figured out what thickness your looking for on the TI? I have a piece that I am wondering what to do with, might be a good project. Not really yet. From what I've seen online it looks like the guages of SS and Ti are the same? I was thinking 19 for the SS which is about 1mm. Did you make your batch of stoves yourself? No, I cut the first one out of card stock to make it work, then took the PDF to a water jet service right down the street. He ordered the SS sheet, my cheap caliper says 45 thou. Its a really nice stove that is about bomb proof if a little heavy, but you can literally boil a gallon pot of water on it. The water jet guy was pretty cheap and I didn't pay a lot for high precision so there was some fitting required, but the guys that bought them seemed happy with them. The Ti roll I have is pretty thin, can't put my hands on my mic but looks about 10 thou. Its pretty rigid but I don't think it is stiff enough for the Nimblewill design. I did a quick mod to my nimblewill. It's not an original stainless but a tin copy. I have had issues with a few of my pots and pans not fitting. So I drilled holes for some support. This is an extreme presentation just to show the versatility it now has. The front to back stakes perfectly support the left to right stakes. I am using dollar store steel garden stakes. 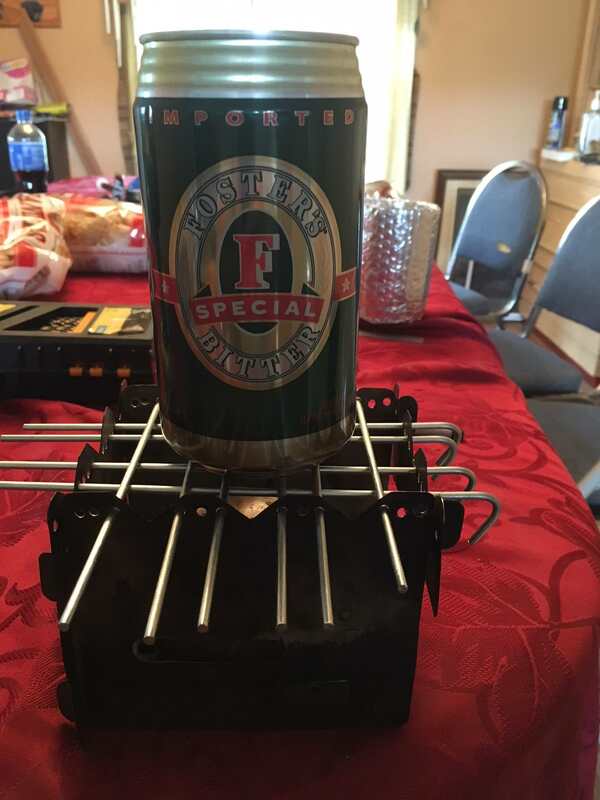 Two stakes are all that are needed for my Fosters pot. I use four for my canteen cup.